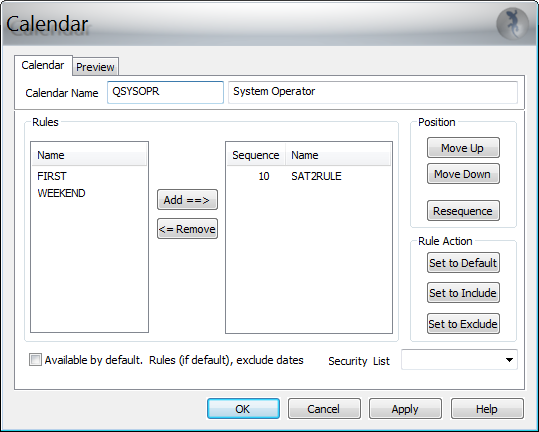 The QMessage Monitor event monitor allows for normal-frequency occurrences; however, situations will occasionally arise where you need to check for an occurrence that doesn't conform to standard schedules. For this, a calendar is required. 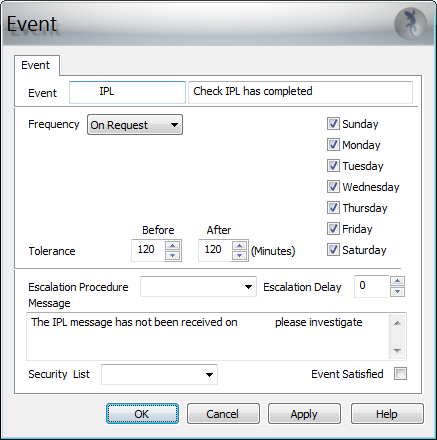 The event monitor doesn't contain a calendar-style function, so we have to manipulate the one found within the escalation procedures. 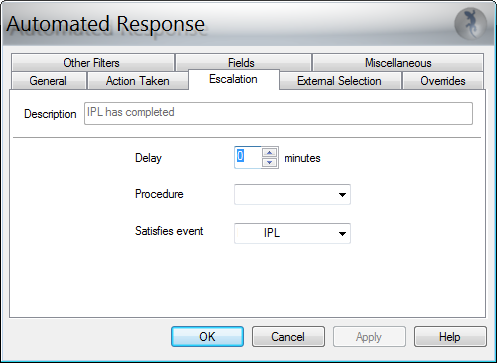 Set up a request event to monitor that the IPL message has arrived. 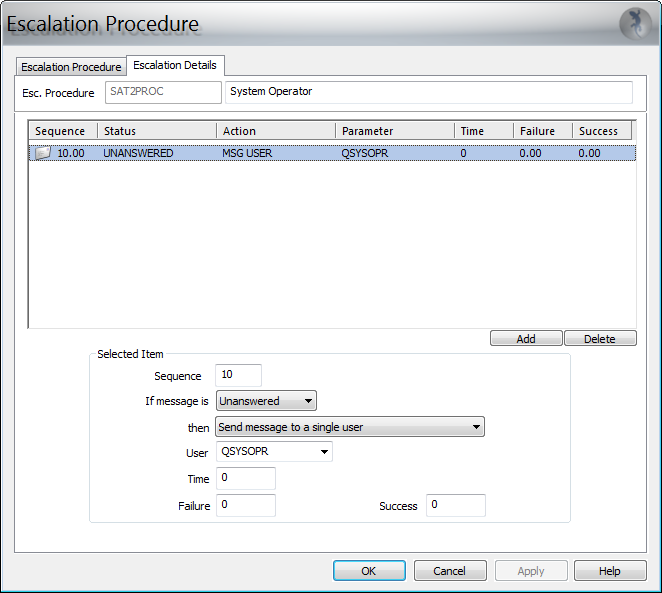 Set up an automated response to monitor for CPF0934 and satisfy the previous request event. Use a job scheduler to send a message every Saturday. 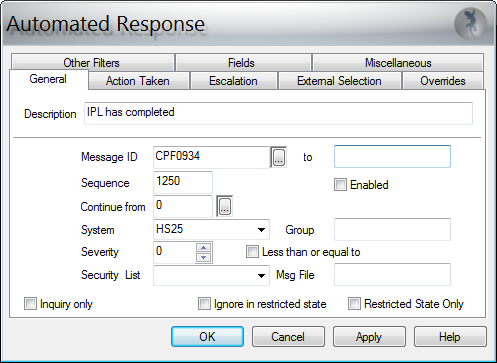 Set up an auto-reply to monitor for that message and run an escalation procedure when it arrives. 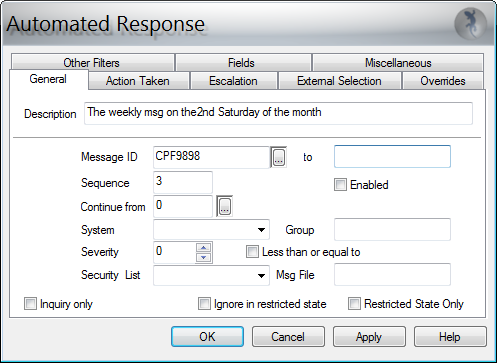 Use a calendar within the escalation procedure to send a second message, but only if it is the second Saturday of the month. 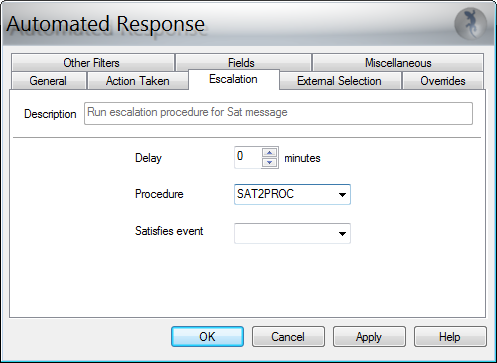 Set up a second automated response to monitor for this second message and execute a MMRQSEVT when it arrives. The first thing we need to do is to define the request event. Then, define the automated response to satisfy it. First, select the General tab. Then, select the Escalation tab. 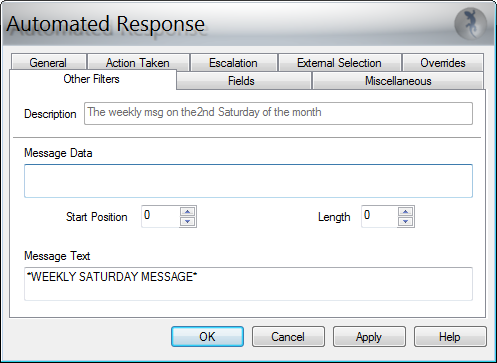 We will now define a simple rule in the IBM scheduler to send a message every Saturday. Be sure to library-qualify the command with the library where QMessage Monitor is installed. The example uses the default library MM. First, we need a calendar rule to define the second Saturday of every month. 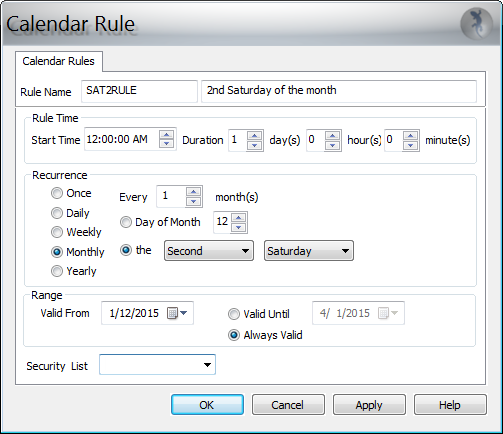 Then, we define a calendar to use the previously defined rule. Then, we define a user and attach the previously defined calendar. 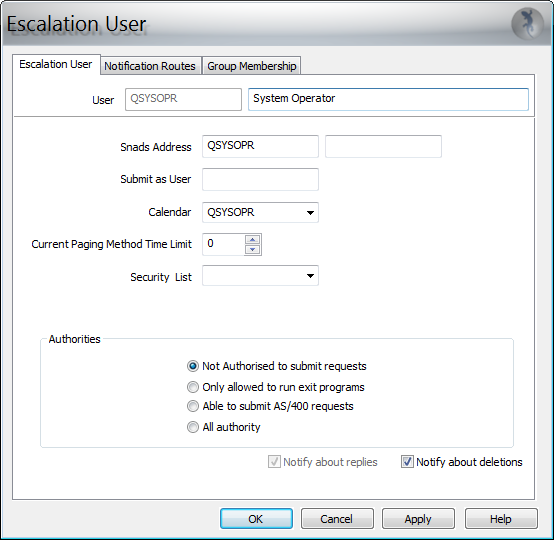 Then, we define an escalation procedure to send a message to the previously defined user. 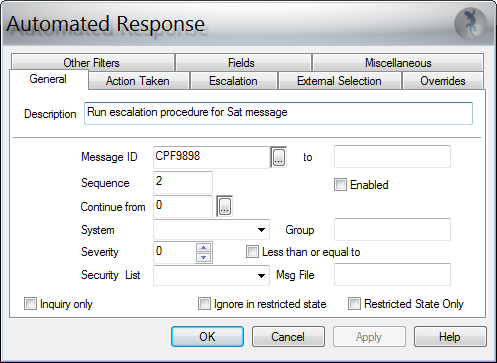 Then, we define an automated response to monitor for the message and execute the previously defined escalation procedure. Now, select the Escalation tab. 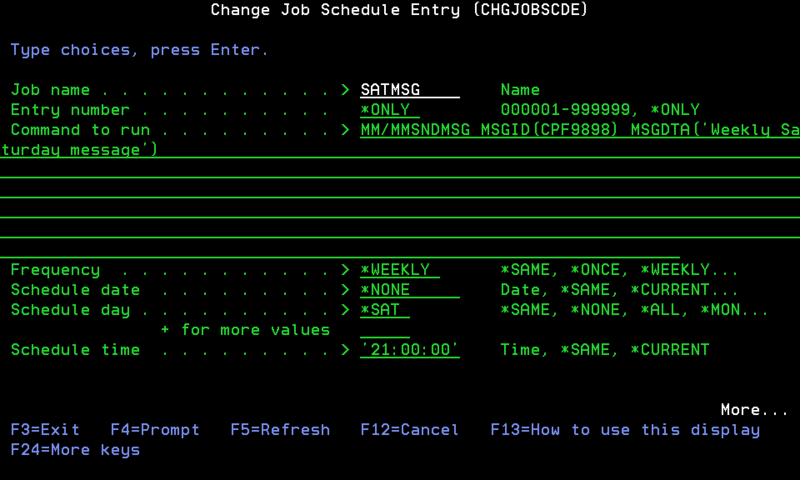 So far, we’ve sent a message every Saturday via the IBM scheduler. We’re monitoring for that message and starting an escalation procedure when it arrives to send another message to QSYSOPR. However, this second message only gets sent every second Saturday due to our calendar rule. Now, we need to define another automated response to monitor for this second message and execute a command that will request the previously defined event (basically set up the date and time). 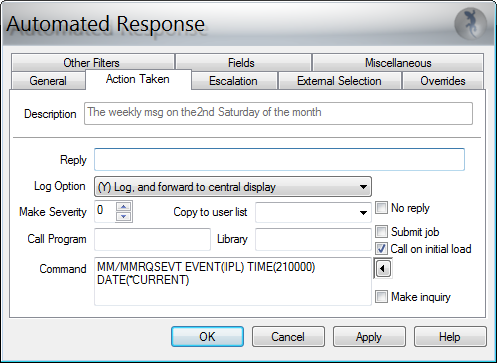 Then, select the Action Taken tab and enter the escalation Command details. If you are not using library MM for the product, please specify the name of the library you have installed the product to when library-qualifying the MMRQSEVT command. Finally, select the Other Filters tab and add the required message text.